Every morning at 7.45am I make my way into the cook hut. 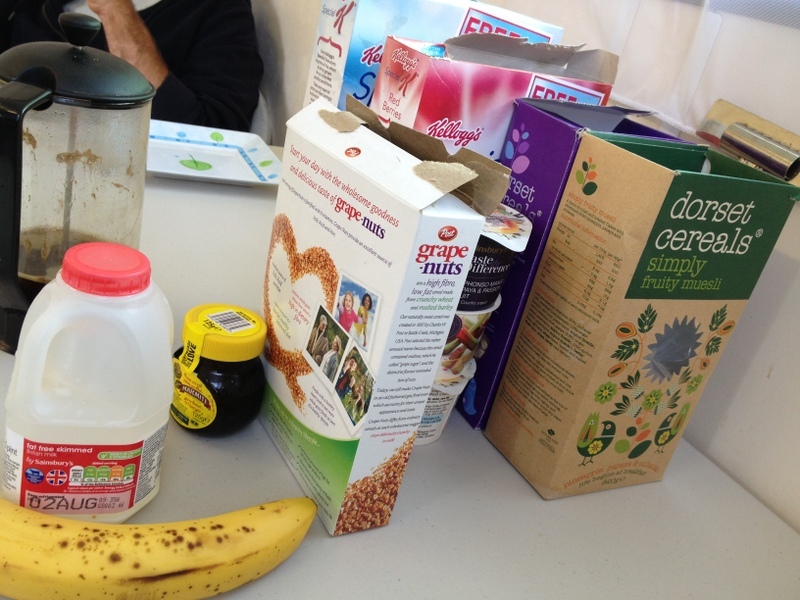 Here I am in the privileged position of having my breakfast laid out for me…and my coffee made….by wonderful Jean, our cook…a lady whose bark is definitely far worse than her actual bite. She guards me like the rottweiler she is, and no one is allowed to disturb me until I have downed one mug of coffee and am ready to face the day. And what a day it was! 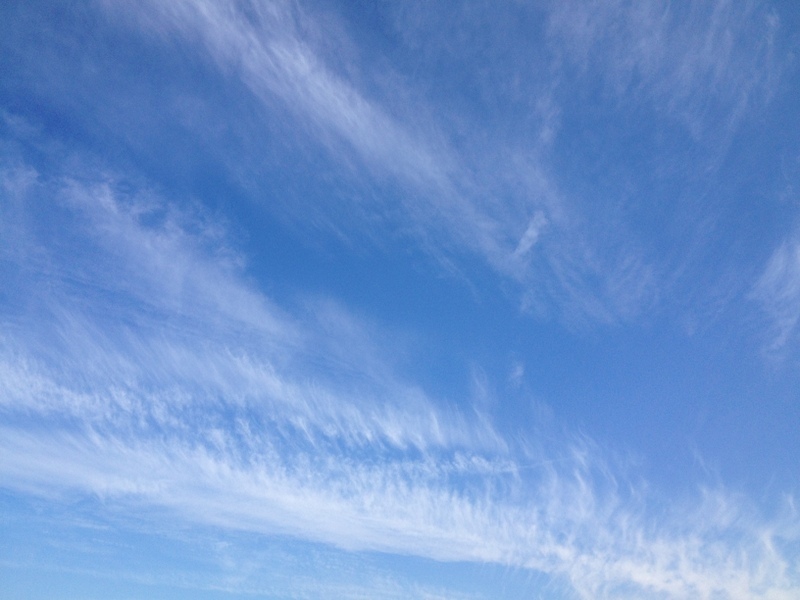 Hampshire perfect, with a high swirl of cloud in a blue sky. Perhaps a little too hot come midday, but a cool breeze in the early afternoon. Yes, we archaeologists are obsessed with the weather. BUT this is NOT good weather for the site….everywhere is baked concrete solid, and a simple troweling exercise turns into an upper body workout. There has also been a run on blister elastoplast! Today we had 2 sets of filming going on. 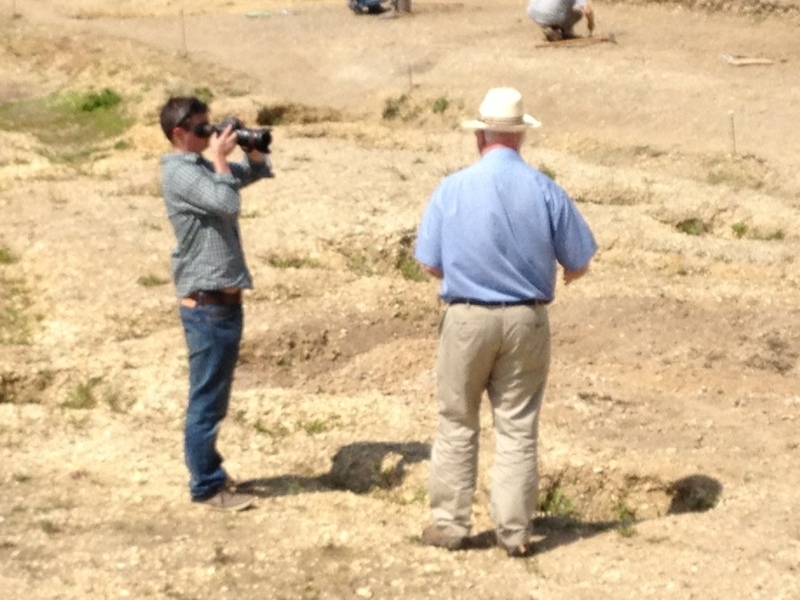 Firstly, Alex Rowson from the BBC, filming for the 3rd series of Digging for Britain, to be screened in November. 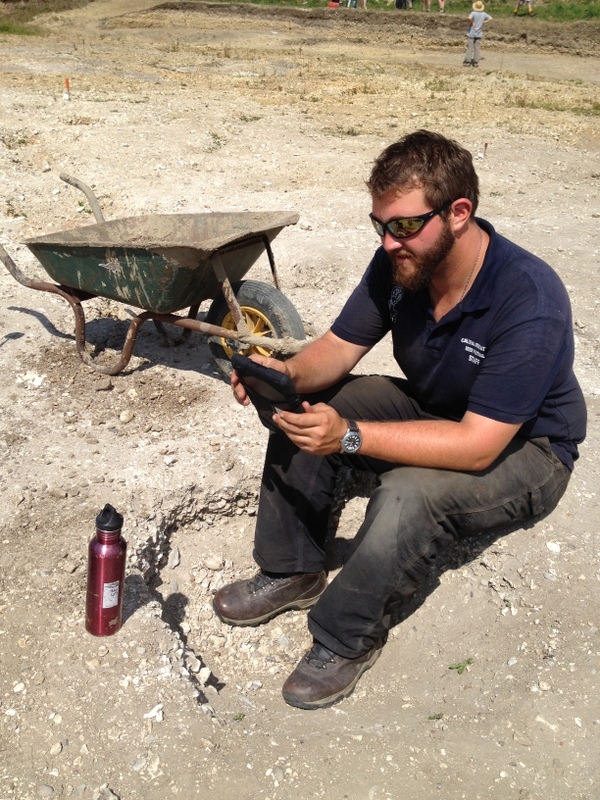 Alex was an Archaeology undergraduate at Reading; he studied Archaeology with History – and attended Silchester for 2 weeks in 2002 as part of his degree. After a Masters at Royal Holloway, Alex changed direction and is now an Assistant Producer on various archaeological documentaries: Time Team and the Richard III documentary are two of his past credits. The format for the new Digging for Britain series is a video diary expose of a number of current excavations, with short videos of key excavation moments shot by members of the teams. Alex was on site today to film Mike and myself, as well as shots of the team in exciting action. Sarah was also filming today with Rebecca Watts who has just completed her PhD with Reading’s Archaeology department. Rebecca is making a film about the wide range of skills an Archaeology degree can provide you with….with the strap line ‘that’s my archaeology..what’s yours?’. Abi was filmed in Finds talking about artefacts found on site which have a gender bias: spindle whorls, hair pins etc. Amy was filmed in the excavation trench, talking about what excavation means to her, and Will was filmed in the Visitors’ hut. Patricia, James and members of the Science team were also filmed enthusiastically talking about the different skills archaeology fieldwork has provided them with. Despite the searingly hot temperatures, work continued apace in Insula IX – all kinds of new post hole alignments are appearing as we strip away the final layers here. Fortuitously I have on site tomorrow a man with a drone and a camera…..he will overfly both Insula IX and Insula III before we start work, to see what sort of vertical overhead shots he can get. Hopefully these will illuminate the different post hole alignments popping up everywhere. 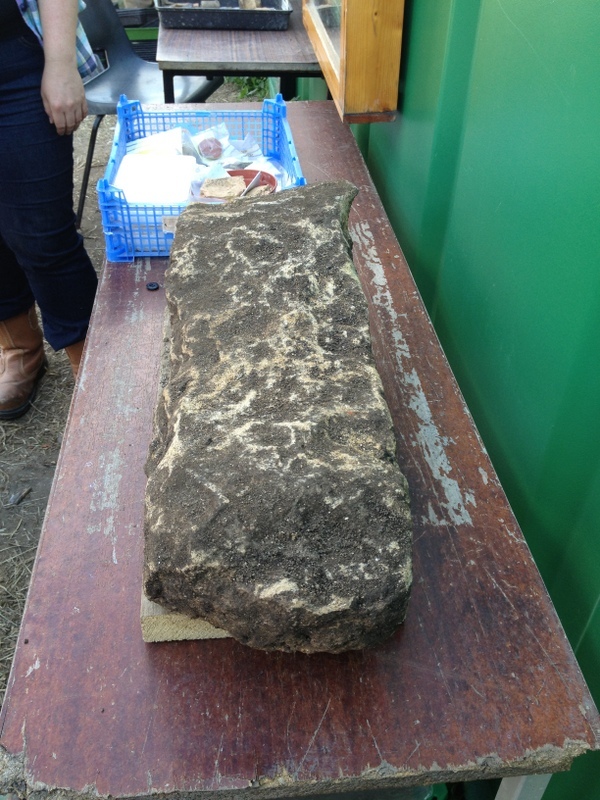 Insula III is churning out the finds from the Victorian trenches, including large pieces of worked limestone, presumably originally from the fabric of the building the Victorians exposed here. 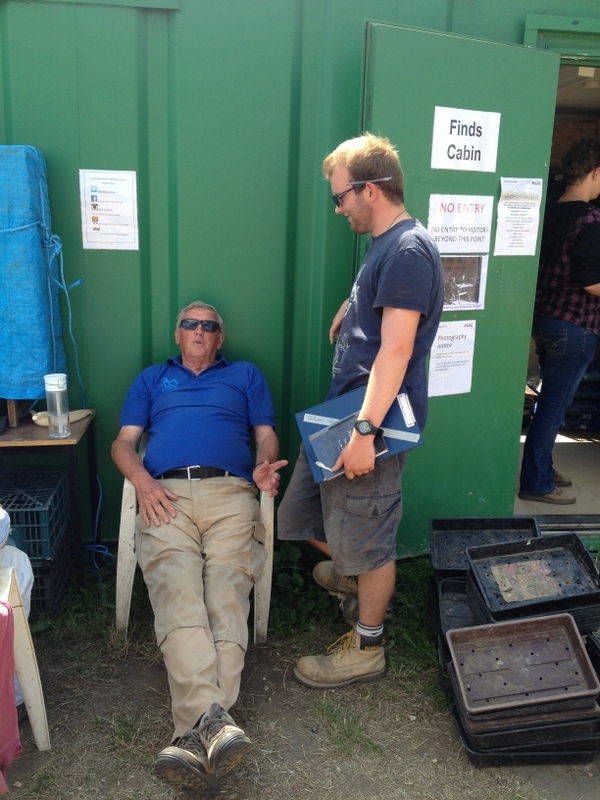 But there is always time for a moment of peace, a joke or two, and the opportunity to sit outside the Finds hut and watch the world go by! It must be wonderful to be John Brown! And Matt’s team is now embracing our use of the iPad minis for context recording! Watch this space for feedback. It’s been a beautiful evening to sit back and recount the day’s escapades…..16 more digging days to go!